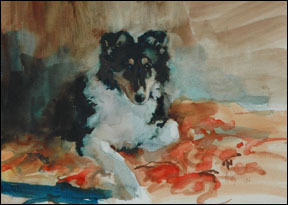 The late Nancy J. Wostrel was a gifted watercolor artist who loved and owned five Rainshade Collies over the decades. 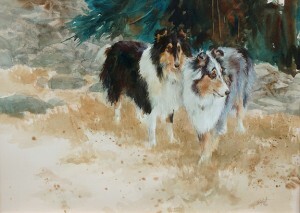 She created these two lovely paintings of three of her Rainshade Collies. The original, entitled “Rainshade” is now displayed in our home. With Nancy’s permission, we had three copies of “Rainshade” professionally reproduced and signed by Nancy J. Wostrel. If you are interested in owning the only remaining copy available, please contact us.